Hema Malini dominates the corporate head-quarters of Kent RO Systems in Noida. The walls, stairwells, alcoves and offices are adorned with posters and photographs of the Bollywood actress, either endorsing the company’s range of water purifiers or launching new products. Aggressive advertising has been the hallmark of Kent’s success. It is what has helped it rise from obscurity to become the second-largest water purifier company in India; from a Rs 25-crore firm in 2005 to a Rs 600-crore giant by 2014. The undeniable growth notwithstanding, Gupta faces his toughest challenge yet. In the last 2-3 years, heavyweights such as Tata Chemicals, Panasonic, LG and HUL have entered the RO water purifier market, posing a threat to Kent’s dominance. According to management consultancy Technopak Advisors, the organised water purifier market is pegged at about Rs 3,500 crore, and is growing at 20 percent every year. With a compounded annual growth rate of 30 percent since 2005, Kent has been expanding faster than the market. But other companies that have entered the space have brand recall and high marketing as well as the R&D heft to displace Kent from the number two spot. While Kent is looking to enter the Rs 1,000-crore club in two years—Gupta’s deadline—it will have to work harder at retaining the second spot in the market. The advantage that a Tata or a Panasonic has over it is brand recall. “There is a generic trust attached to the Tata name,” says Parag Gadre, head, water purifier business at Tata Chemicals. Tata launched RO purifiers in Kolkata and Bangalore in January 2014, and aims to have a presence in 25 cities over the next quarter. “Over the next 6-9 months, we will launch products at both lower and higher price points,” he says. Thus, keeping Kent ahead of the pack will be Gupta’s first challenge. The home-made purifier worked well. “It struck me that there must be a market for it,” says Gupta, who started manufacturing purifiers at his oil meter factory, with a seed capital of Rs 5 lakh. The first RO purifier he made for his family cost about Rs 50,000. But after he started Kent, he sold the purifiers for Rs 20,000. “I made some 25 purifiers in the first batch. Very few people bought it, because this was in 1999 and Rs 20,000 was a big amount,” says Gupta. Today, the company manufactures 4.5 lakh purifiers in the Rs 16,000-18,000 range. The manufacturing happens at a factory in Rourkee, Uttarakhand. To keep pace with its growth, the company is building a new plant in Noida, which will be operational in two years. Kent got its big break in 2006 when it signed on Hema Malini as a brand advisor. Gupta knew that if the company had to grow it would have to build brand equity and educate customers about RO technology. “We have become synonymous with RO purifiers. Even today, my biggest challenge is educating customers about the importance of an RO purifier. The government doesn’t want to educate customers because if they do so, it will be seen as their failure to provide good drinking water,” says Gupta. The company spends 15 percent of its revenues on marketing. Pragya Singh, associate vice president (retail & consumer products) at Technopak, says, while Kent has done a good job of building trust through its media campaigns, it needs to be alert to growing competition. “Kent will have to constantly upgrade to be relevant, and continue with brand building,” she says. Gupta is counting on Kent’s technical superiority and innovation to stay ahead in the water war. Since he launched his first RO purifier, the company has introduced 20 different models. “We have filed five patents in the last five years or so, and three have been granted. Our products have been certified by the National Sanitation Foundation and the Water Quality Association (WQA), which have a very stringent certification process,” he says. 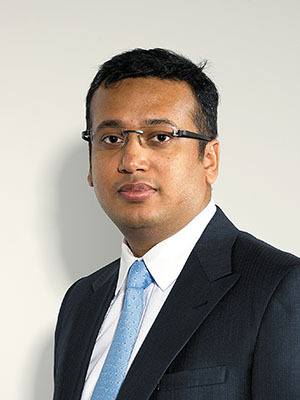 Gupta’s son Varun, who joined the family business in 2006 as a director, argues that Kent is better placed than its competitors when it comes to identifying consumer needs. “Every year we come up with a new technology, which creates an entry barrier for new players,” he says. The patents are related to newer processes for water filtration, more technologies that retain essential natural minerals, and purifiers that store and recycle water. Varun believes that Kent’s pace of innovation will make it difficult for other companies to catch up. “A lot of multinationals such as Philips and Whirlpool entered the RO market in the past but wound up their operations because they couldn’t connect with the customers.” He, however, might be underestimating the longevity of some competitors who aren’t lagging behind in innovation. Panasonic, for instance, entered the RO water purifier market two years ago, and introduced a new alkaline technology that removes the water’s acidic content. Kent’s competitors dismiss claims of technical superiority. 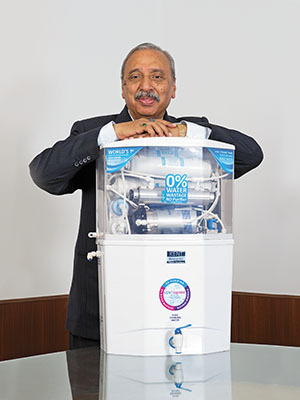 Eureka Forbes, which has a 54 percent share in the overall water purifier market, says it has filed for 45 patents—not all are RO—in the last five years. “We have over 110 certifications from leading laboratories including an endorsement from the Indian Medical Association. Globally, we received WQA’s certification 10 years before Kent got it,” says Marzin R Shroff, CEO, direct sales and senior vice president, marketing, Eureka Forbes. Another new entrant is Luminous Water Technologies, which launched Livpure RO two years ago, and claims to have captured a 10 percent market share already. Rakesh Malhotra, its founder-chariman, argues that no company is technically superior. “There is no product differentiation that Kent can lay claim to because the core components of an RO purifier such as membrane and pumps are available to everyone. The only real advantage it has is the momentum it has gained because of their head start,” he says. While companies such as Tata Chemicals and HUL have a brand legacy that’s entrenched in the Indian psyche, Kent is counting on its superior customer service to retain old customers and acquire new ones. According to Varun, one of the toughest challenges for any new player is after-sales service. “This is a product that if it breaks down, you really can’t live without. A quick turnaround time is a key factor in customer service and we have an established service network,” he says. Kent has 800 to 900 franchised service centres and about 5,000 to 6,000 technicians across the country. The average turnaround time for customer complaints is a day or two, he claims. While new entrants are beefing up their their after-sales units, Kent is looking to strengthen its presence in tier II cities. “The day customers start thinking of an RO water purifier as a necessary home appliance, they will stop thinking of it as an expensive product,” says Varun. Metros such as Delhi are already converting—the capital already has the highest water purifier penetration in the country at 35 percent. “Real growth will come from tier II and tier III cities,” says Varun. For instance, Bihar is Kent’s fastest growing market—this should give an indication of where the future growth lies for the company as well as its competitors. I find aquaguard service much better, changed to KENT 2 years back, but hard to get service done, equipment quality too little less. Now I feel like changing from aquaguard was a mistake. This company need to service better. I\'m not sure why I got this feeling. I feel the article has ended abruptly. Not in the \'style\' of Forbes which I regularly read. :).